The pillars of Europe's security are damaged beyond repair and Europe's leaders are in denial. Expect very heavy turbulence. The peaceful post-1989 order on the old continent rested on three key pillars: NATO, the EU, and the ruling mosaic of centre-left-and-right parties. NATO provided the hardware, the EU delivered the soft-ware, and the ruling parties offered legitimacy. All these three pillars are now damaged beyond repair. Donald Trump's victory has buried NATO. Collective defense and deterrence can only work if they are not subject to speculation. Trump has made it clear that he wants to keep his options open. The everything-goes policy is a recipe for anarchy, not security. I am not even talking about Trump's links with Vladimir Putin. The Brexit referendum has buried the EU. 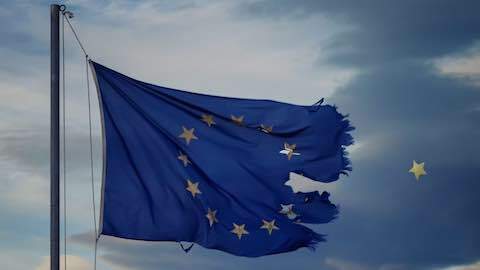 In the next few years the EU will be absorbed by the nasty divorce proceedings, leaving it with no time and energy to project its soft power abroad. This means that the neighbourhood will be ever more unstable, generating refugee flows and hampering trade in commodity and goods. Many people have criticized the EU enlargement policy, but Turkey and Ukraine could well resemble Romania or Poland, had enlargement policy not been put on ice. (Of course, this is not to say that Poland and Romania are champions of stability and good governance). The spectacular rise of anti-establishment parties has buried the liberal consensus on which Europe's security was so dependent over the past three decades. This consensus envisaged open borders, development aid, multilateral diplomacy, and promotion of human rights and democracy. All these ideals are now being openly questioned by the new kids on the block and the electorate seems not to care any longer. Trump, Brexit, and the counter-revolutionary insurgence against liberal values are not an accident of history. Liberals from centre-left-and-right parties have time and again betrayed their ideals: they invaded other countries on dubious grounds and even tortured prisoners. No wonder the electorate became cynical and started to back alternative parties and politicians. Brexit resulted from the EU's inability to reform itself and find some ways to empower ordinary citizens and not just bureaucrats and lobbyists. Trump is a child of the US democratic pathologies responsible for rampant inequalities, governmental paralysis, and imperial over-stretch. Today no one knows how to sort out all the mess and make Europeans feel safe. It is not even clear who is going to do the diplomatic cleaning up operation. Germany has just designated a new foreign minister whose abrasive style in the European Parliament has antagonised most European leaders. Italy has just appointed a new foreign minister with no real party behind him and zero diplomatic experience. The United Kingdom's new foreign secretary is famous for making silly jokes, but not for strategic visions. Poland's foreign minister seems more interested in combatting cyclists, vegetarians, and environmentalists than striking meaningful international deals. With top diplomats like this Europe is not likely to pass safely through the expected period of turbulence. The experience of the past few years suggests that most problems will arrive on Mrs Merkel's desk. Given the upcoming German elections, she will not be pleased. But whom can she ask for help? Mrs May, Szydło, or Le Pen? I am not sure that gender solidarity will do the trick. Security is not necessarily about building an adequate military hard-ware against the perceived enemy. It is more about creating an environment conducive to peace through common rules of engagement, mutual trust, and normative convergence. This is why institutions such as NATO and the EU were crucial in maintaining peace together with the liberal consensus about legitimate and illegitimate behaviour. Without these pillars of European order, a small, unexpected conflict can go out of hand producing mutual insults and suspicion leading to the break-down of communication, conspiracy theories, irrational behaviour, and aggression. Hardly anyone expected that the assassination of Archduke Franz Ferdinand of Austria in Sarajevo in 1914 will lead to a war killing millions of people. We do not know what kind of surprises await us a century later, but as we enter a new period of confusion and turbulence it is important to fasten our seat belts and stop arguing with each other. Article: Courtesy OxPol (The Oxford University Politics Blog). Europe: "Europe is No Longer Safe"